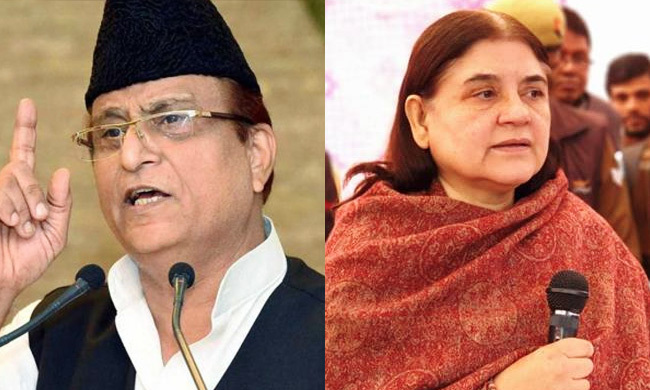 The Election Commission of India has barred SP leader Azam Khan from campaigning for 72 hours starting from 10 AM of April 16 for his indecent remarks against BJP candidate Jayaprada during an election meet at Rampur. Also, the poll panel has barred BJP leader Maneka Gandhi from campaigning for 48 hours starting from 10 AM of April 16 for making communal remarks.In an election rally at Sultanpur last Saturday, Maneka Gandhi had said that if Muslims do not vote for her, they will not receive any benefits. The Commission observed that Azam Khan's comments were "not only indecent but also derogatory and totally uncalled for". It recalled that Khan was censured for his provocative remarks during 2014 elections and had not changed his way of campaigning and was still indulging in using objectionable language. As regards Maneka Gandhi, the poll panel observed that her comments violated the model code of conduct which prohibited appeal to communal or caste feelings to secure votes. Earlier in the day, the ECI had barred UP CM Yogi Adityanath and BSP supremo Mayawati for 72 hours and 48 hours respectively for communal remarks.